The flag of Vanuatu is a blend of four colors red, green, black and green. There is a 'Y' placed horizontally on the national flag of Vanuatu which signifies the chain of islands of the country which are placed in this particular shape. There is a black colored triangle on the hoist side of the black which also consists of the national emblem of Republic of Vanuatu. There is thin yellow line inside the black 'Y' which represents sunshine and Christianity which is the most practiced religion of Vanuatu. The black color signifies the Melanesian population and the red part symbolizes bloodshed. The green color on the national flag of Vanuatu symbolizes the lush green vegetation and crop growing lands. 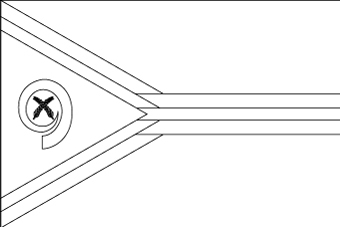 The conventional symbol of prosperity of the Vanuatu culture is depicted on the national flag in the form of the emblem. Capital: Vila on Efate Island. Location: On more than 30 islands in Melanesia the largest being Espiritu Santo Efate and Malakula. National Flag: Red over green with a black triangle in the hoist the three parts being divided by fimbriations of black and yellow and in the center of the black triangle a boar tusk overlaid by two crossed fern leaves.